Works by 27 composers are included in this 248-page comprehensive survey of piano music written between 1750 and 1820. 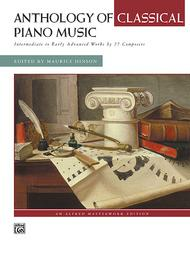 The pieces in this collection range in difficulty from intermediate through early-advanced levels and cover the widest range of styles and idioms of the Classical period. Historical and biographical background, performance notes and suggested realizations of ornaments are also provided by Dr. Hinson. The comb binding creates a lay-flat book that is perfect for study and performance.